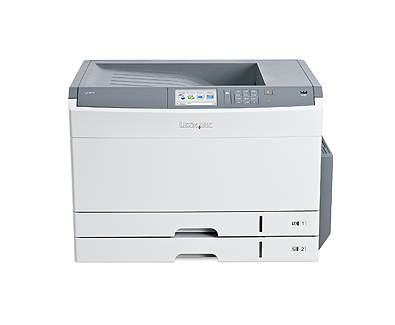 The Lexmark C925de colour printer delivers outstanding A3 colour printing, easy-to-use features and productivity solutions, all through an affordable, compact design. 150-sheet and 250-sheet input trays and a multipurpose feeder come standard, allowing you to load three media types. Robust connectivity makes it easy to integrate into most network environments. Reduce unnecessary printing and simplify work processes through solution applications preloaded on your device. Choose additional Lexmark solutions to fit your unique workflow needs. Protect your device, data and network with innovative security controls, like authentication and authorisation, and an optional hard disk with disk wiping and encryption. The 4.3-inch (10.9 cm) colour touch screen allows you to operate your printer with ease and confidence through smart and intuitive navigation, easy access to workflow solutions and shortcuts, and the ability to preview your documents and print jobs at the device. Vibrant, professional-quality output on a wide variety of media for more colour printing in-house. Supports media up to 11.7 x 48 inches. Trays Extended (in. - H x W x D): 16.54 x 34.0 x 36.93 in.